I've always been a big fan of OPI nail varnishes, but due to their price (currently £11.95 each) I don't own many. At the end of last year/beginning of this year I got a little obsessed with a few of their shades and luckily I managed to find them in various sales so I could add them to my collection. 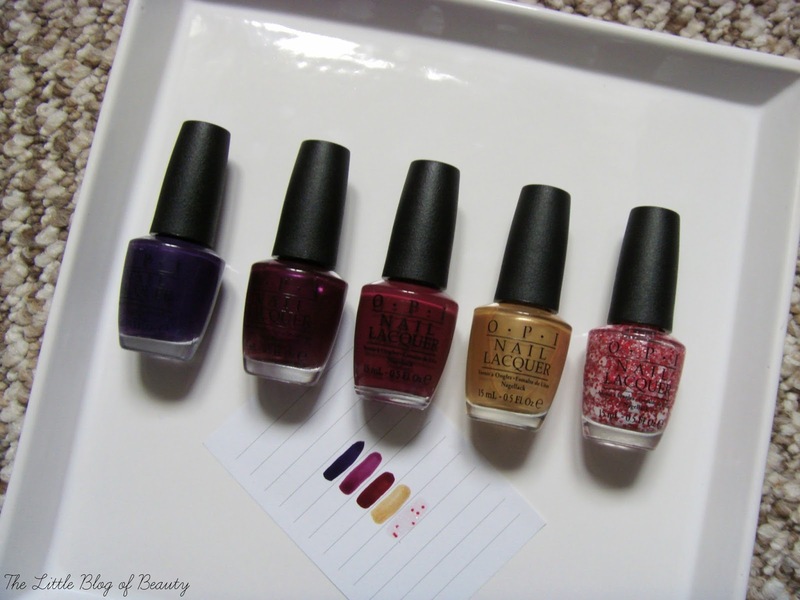 As I've recently acquired five new OPI shades I thought I'd do a post on them. 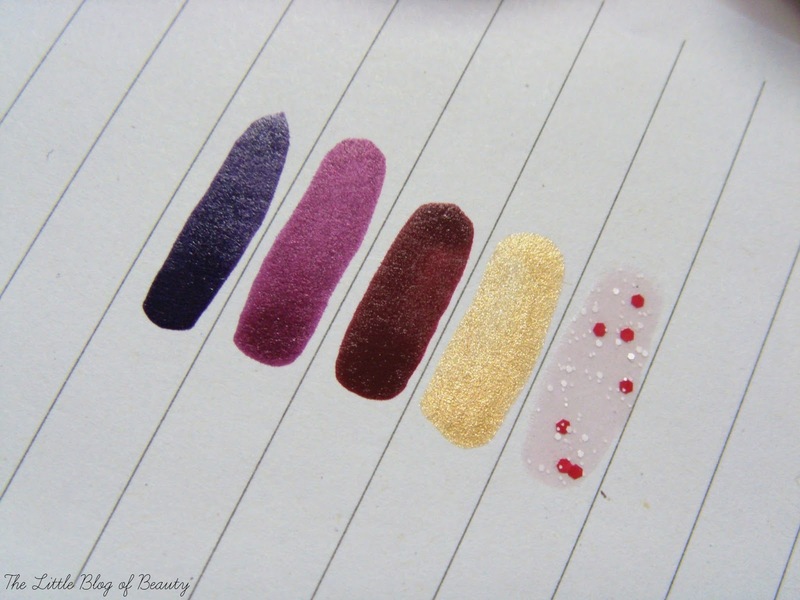 Four of these shades are from the Gwen Stefani Holiday collection and one from the Coca Cola collection. The Coca Cola Bearest of them all confetti effect top coat I actually won from Debenhams Beauty Club and this came in a little gift set with a very cute little Coca Cola branded polar bear. This is a clear top coat containing tiny white specks, slightly bigger red pentagons and much larger white hearts. Unfortunately I forgot to fish out a heart for the picture above. I haven't actually tried this one out yet so I'm not sure how this looks and what colours it works best with. As I said I've become a little obsessed about OPI shades recently and my obsession has mostly been focused on the Gwen Stefani Holiday collection. I've taken to checking the beauty section of TK Maxx recently to see what nail varnishes they have (although I'm very cautious about what I buy!) and I spotted Rollin' in cashmere for just £3.99. This is a metallic shade and it's actually the first OPI shade I've been a little disappointed with. The first time I used it I found the first coat cracked slightly on my nails and it doesn't always apply very evenly, although metallics are notorious for this. In the last few days I have discovered that you're not supposed to use a base or top coat with metallic shades (every day's a school day!) so I need to give that a try. I spotted I carol about you used in some nail and I knew I wanted it. I received some money from my parents for Christmas and while browsing the ASOS sale for some bargains I spotted a few Gwen Stefani shades were in the sale, this being one of them. So I bought it for around £8.50; not an amazing bargain, but better than £11.75. This tends to look quite blue in photos but it's actually a deep purple with a very fine shimmer. I then also spotted Kiss me - or Elf! used in some nail art and decided that I desperately needed this shade in my life as well. I tracked this down for £8.36 on BeautyBay and discovered OPI and Essie were 3 for 2 at the time so I also got Just BeClaus and Essie Watermelon, which I posted about recently. Just to make you aware several Gwen Stefani shades are now just £6.50 on BeautyBay (including Just BeClaus) and pretty much all other shades are down to £8.36. Kiss me - or Elf! is a beautiful claret type purple/red with a fine shimmer. When I first saw Just BeClaus when it arrived I was concerned that it was very similar to Miami Beet (which I do own) but Miami Beet appears a little lighter, although they are very similar. As Miami Beet (beetroot) suggests they are both dark red/maroon type shades. The last three shades I've mentioned are all really lovely so it's likely they'll be appearing in some nail art very soon. Are you an OPI fan? Love these colours espcially bearest of them all! I don't think I have seen another nail polist like that!